It takes a community of engaged advocates, partners and supporters to reach all of the cancer-fighting families that need our help. That’s why we’re excited to introduce Resilience Gives, a sock-based fundraising platform, to the Family Reach network. Family Reach is here to ensure the funds raised for financial assistance are distributed efficiently and effectively, so that families fighting cancer can keep a roof over their heads, put food on the table and maintain access to treatment. Amy is a cancer survivor, mother of two young children and beloved member of our community. We were able to assist Amy with money for rent, groceries and hospital travel while she was undergoing treatment. She was then connected to our partners at Resilience Gives and got to work on creating her own sock fundraiser. 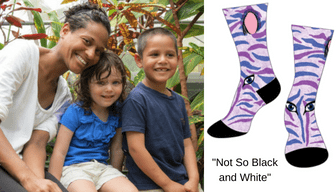 Amy named her sock design Not So Black and White to represent the fact that cancer affects everyone. Cancer does not discriminate. It was 2016 when Jake Teitelbaum, Resilience Gives creator, found himself crumpled on the bathroom floor during treatment. He was feeling sad, angry and hopeless, when he peered down at his feet. The sight of his favorite pair of socks forced a smile across his face. An idea was born. Jake founded Resilience Gives to make a direct, tangible difference in the lives of the families he found himself surrounded by. We are proud to partner with Resilience Gives and provide our families with an additional way to combat the cost of cancer. Browse sock designs here! They make for wonderful gifts, for yourself or a loved one. Start a fundraiser today and join the community using socks to fundraise for change.